If you find that you’re gaining weight, you must not only look at what you are eating, but how much. A good place to start is to know what a standard healthy portion size looks like to use as a guide to compare your own food intake to. A serving size of protein can be compared to a deck of cards. A serving of starch is typically ½ cup and a serving of non-starchy vegetables is ½ cup of cooked or 1 cup of raw. 1. Use a small plate. 2. 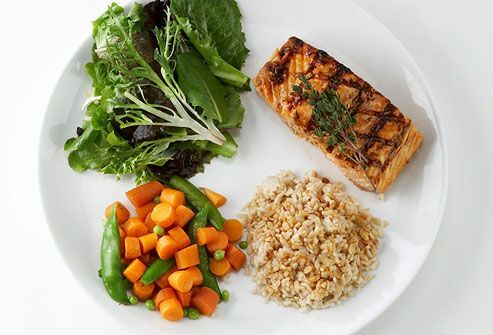 Fill half of your plate with non-starchy vegetables. 3. If you’re still hungry after only one serving, limit second helpings to salad or vegetables only. 4. Drink a large glass of water prior to your meal. 5. Serve your food in the kitchen, leaving serving plates off of the dining table. 6. When dining out in a restaurant, ask your server for an extra plate. When your meal is served, immediately put the appropriate serving on the plate and give the server the rest of the meal to wrap up for you. Restaurant portions are between double and triple the size of a healthy serving, so you’ll be taking a meal or two home with you for another day. Using easy portion control tips like these throughout your day can gradually put you on the road to weight loss success without feeling deprived or hungry.